We are huge fans of My Little Pony in our home, I'm sure most of you readers know that by now. So when we got the chance to review Adventures of the Cutie Crusaders on DVD, my kids were thrilled. With all the bright and beautiful colors on the screen, even my seventh month old loved watching the DVD and adored all of the songs. She absolutely loves music, so it was really good to see her enjoy this DVD as much as the older kids did. The DVD is now available retailing at $13.97 and comes with 5 episodes including sing-a-long songs as well as coloring sheets. The fun does not stop there and for more Pony fun PlayDate Digital announced the new Cutie Pox Storybook App. This interactive story book allows you to enter the world of Equestria for an adventure full of excitement, humor and friendship! It's available on both IOS and Androids devices. This is a cute and fun game for your kiddos to enjoy. Disclosure: All opinions are my own. 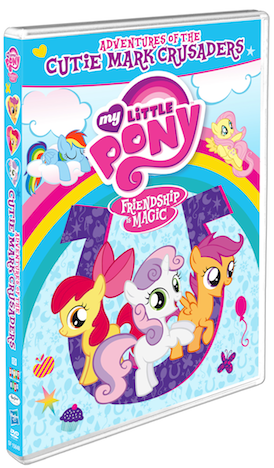 I received Adventures of the Cutie Mark Crusaders on DVD at no cost for the purpose of this review. No other compensation was received.